Short was stopped out. Looking for new setup either way. The support level is still holding the price above. 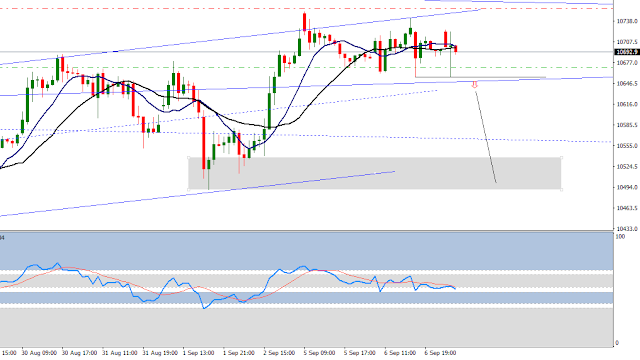 If this level breaks I think it is very likely that the market will drop to around 10500 where the next support zone is. This pattern looks complex and didn't confirm my short idea yet. The only thing why I didn't close my position is that the momentum turned down two times from a level where a drop can be anticipated. The 15 minutes chart may show some sings for a downside movement because the momentum turned down from bearish resistance and spiked in to the bullish support zone while the price action tested yesterday's minimum. Then the pullback failed to reach the neutral/bullish territory. A good confirmation of my short idea would be that the market won't go back above 10712 and impulsively breaks the support level then retest this level. 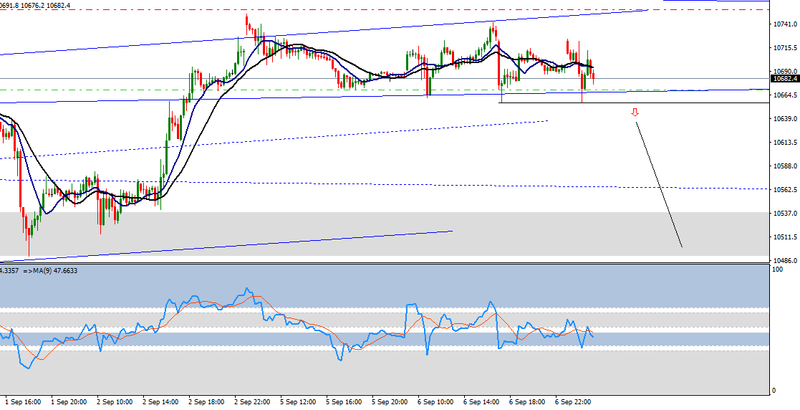 The break of this support level is do or die for the bears. We'll see.